The grass is green and getting greener at the four venues as this country prepares to host Warm up matches ahead of next yearâs International Cricket Council Cricket World Cup. Chairman of the Local Organising Committee, Fitz-Gerald Huggins is pleased with the latest developments. He revealed that two species of grass have been used at the main venue, the Arnos Vale One Playing Field. 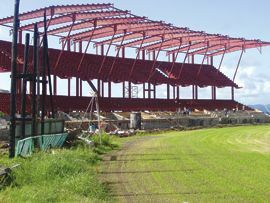 He referred to this facility, as the âshow groundâ as it will host Warm up matches. Arnos Vale two, Sion Hill and Stubbs are the practice venues. âGenerally I am happy with the progress and I am positive that when the ICC officials visit in October/November, we will get the green light,â Huggins added. Grounds and Fields Manager Ian Allen endorsed his comments. He stated that planting of seeds at Arnos Vale One started in August and he pointed out that the fields were receptive to the seeds. He admitted that there was some weed infestation,â but indicated that application of chemicals was adequate to take care of that situation. A specialist from Gregory International, responsible for the maintenance of fields throughout the region had supervised the re-grassing process and had given the operation their full endorsement. Two additional wickets have been put in at Arnos Vale One to bring the number to six, while one at Arnos Vale Two brings that figure up to two. Two additional wickets at Stubbs increase that tally to four, while there has also been an increase of two more pitches at Sion Hill.